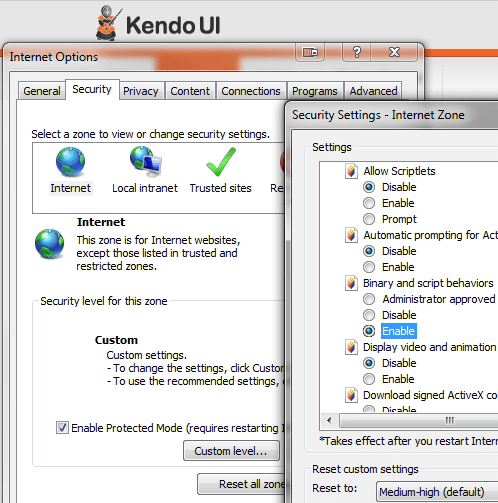 This page provides solutions for common problems related to the Kendo UI Diagrams. A security message suggesting that you enable the Intranet settings might appear. If you choose to do so, then you do not need to follow the steps below. Select Internet Options > Security > Internet (or Local intranet) > Custom Level and enable Binary and script behaviors by ticking the Enable radio button. Such issues are typically caused by the different fonts that are used on screen and in the PDF. For display, the browser substitutes the selected font with whatever is provided by the system. During export, you take the metrics from the actual font in use and determine the PDF layout from that. It is likely that the resulting PDF is displayed with a different font, leading to layout and encoding issues. The solution is to make the fonts available for embedding. This means that the fonts should be available as binary TTF files and registered for export. This is demonstrated in the PDF Export demo on Diagram as well. The example below demonstrates how to embed fonts in exported PDF.